Gainsborough Events Management is an SIA Approved Contractor (ACS) of Security and Stewarding to many of the most prestigious events and leading Venues in the UK. We are a dynamic and enthusiastic Company with decades of experience supplying our services and expertise to a multitude of the UK’s largest public events. We provide event Security Management for Exhibition Centres, Coastal Boat and Air Shows, Motor Racing Circuits, Major Music Festivals, Concerts and County Shows.We have the proven ability and experience to plan the operations and logistics for any event in the UK. Over the years we have developed strong long-term relationships with many of the industry’s key players, some in excess of 20 years, and with good reason – we are loyal to our Clients and dedicated to the success of their projects and events. 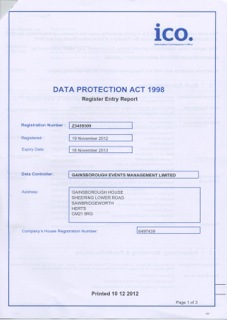 Gainsborough Events Management Ltd. adheres to GDPR 2016. Gainsborough’s management brings together many years of combined hands-on experience in Event Security Management, hence our motto: “Excellence Through Experience”. We provide a superior service characterised by extreme attention to detail and quality control. Our drive and reputation are reflected in the performance of our management and staff. Gainsborough’s staff are the operational face of the Company and we take pride in the fact that so many of them have been with us for many years. Their dedication and loyalty is reciprocated by the management team, ensuring high levels of morale, professionalism and continuity throughout all operations. Our high standards of service have seen us secure and retain contracts for some of the most prestigious public events in the UK, at renowned venues. Many of our contracts are now into their 10th Year or more – it is the quality of ongoing relationships that continues to prove invaluable to our Clients. For references on our work, please use the following contacts.